Author Jack Quarles exposes clichéd wisdom that leads to lost time, money, and opportunity, while offering ways to provide clarity in decision-making process. 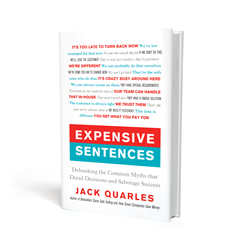 Author Jack Quarles’ Expensive Sentences exposes clichéd wisdom that leads to lost time, money, and opportunity, while offering ways to provide clarity in decision-making process. I am convinced that ‘expensive sentences’ are silently sabotaging companies, non-profits, schools, governments and families. Talk is never cheap. In fact, whether in the business world or the household, the wrong sentences can be very expensive. Learning what those “expensive sentences” are and how to free yourself from being entrapped by them is the focus of Jack Quarles newest book, Expensive Sentences: Debunking the Common Myths that Derail Decisions and Sabotage Success. “Expensive Sentences tell us that we are stuck, that someone is special or that something is scarce. While there is often truth that underlies each of these concepts, they’ve become costly, clichéd wisdom,” Quarles explained. In Expensive Sentences, Quarles illustrates the prevalence and impact of this flawed reasoning through historic examples, business stories, and personal episodes. Readers will discover how to identify common decision-making pitfalls in real time, and learn to guide teams back to fact-driven thinking and better outcomes. Quarles groups the nine primary Expensive Sentences by the categories stuck, special, and scarce. In the book, he provides real-world examples of how they are used, how you can gauge if they are actually expensive, and how to remove them from the workplace and home. 1. It’s too late to run back now. 2. We’re too swamped to deal with that now. 3. We need it yesterday. 3. That’s the way we’ve always done it. 1. We can’t afford to let him go. 3. We can probably do that ourselves. As a bonus, Quarles offers a handful of other potentially costly sentences and how to handle them. Visit http://www.BuyingExcellence.com for more information about Jack Quarles. Jack Quarles is a speaker, author, and consultant who has saved companies tens of millions of dollars. Jack has co-founded several startups, advises mid-sized companies, serves on the boards of two international non-profits, and has received degrees from Yale University and Northwestern’s Kellogg School of Business. Jack’s previous books, How Smart Companies Save Money and Same Side Selling (co-authored with Ian Altman), were Amazon #1 Bestsellers. He lives in Toledo, Ohio, with his wife and two daughters.